This page includes the next set of waterfalls from 101 to 145. Back to Part II. Sculptured Falls * (20 ft) (FKS): This remote falls is located near the mouth of a twisty canyon that leads to Inspiration Falls (see above). A half dozen small falls and pools are located on either side of this falls. Manning Narrows (50 ft aggregate): On the way to Manning Falls (see above) is a lovely narrows section with a half dozen picturesque small falls and pools on polished bedrock in an extremely lush setting. Mystic Falls * (60+ ft): A tall falls in a nice setting of old growth redwoods and hanging ferns. This falls maintains some flow year around but the drainage does not support high volume. Lower Dragon Falls * (100+ ft sequence): Below the main segment of Dragon Falls lies a half dozen other segments, some of which are tall falls in their own right. See Dragon Falls for video. Pocket Falls (60 ft aggregate): A series of three falls in short succession. The lowest falls is around 12 feet, the middle falls (composed of two steps) is 22 ft, and the upper falls is one single 25 ft drop. The first known sighting of this falls was by Brian Robinson who also named this falls. Mossy Apron Falls (40+ ft) (FKS): Named after the cloak of moss that covers the rocks of this falls. 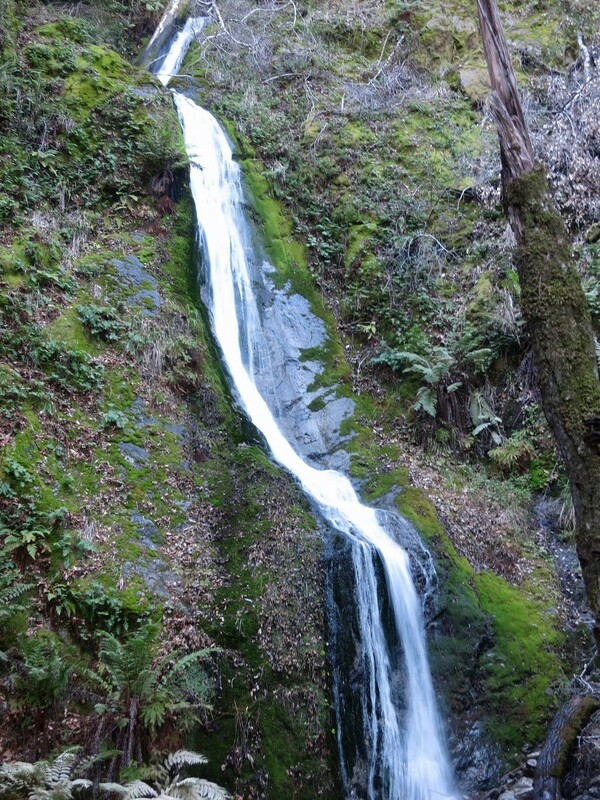 Tassajara Falls (140 ft): A very tall and thin waterfall with two segments near the Tassajara Zen Center. The lower segment is by far the tallest with a long free fall section and then a slide over the smooth rock face. The impressive rock cirque is arguably the best part of this falls since it likelly only has substantial flow either during or immediately after heavy rain. 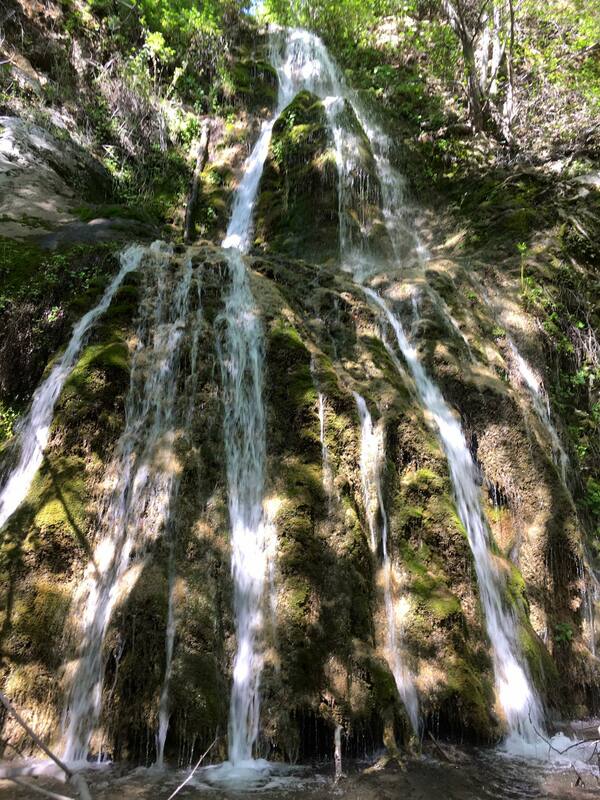 Tassajara Cutoff Falls (110 ft): Another pencil thin falls near the Tassajara Zen Center that flows over a tall white rock face. The Tassajara Cutoff Usetrail provides the best viewpoint. This falls will only have substantial flow greater than pictured either during or immediately after heavy rain events and goes completely dry in the summer and fall months. 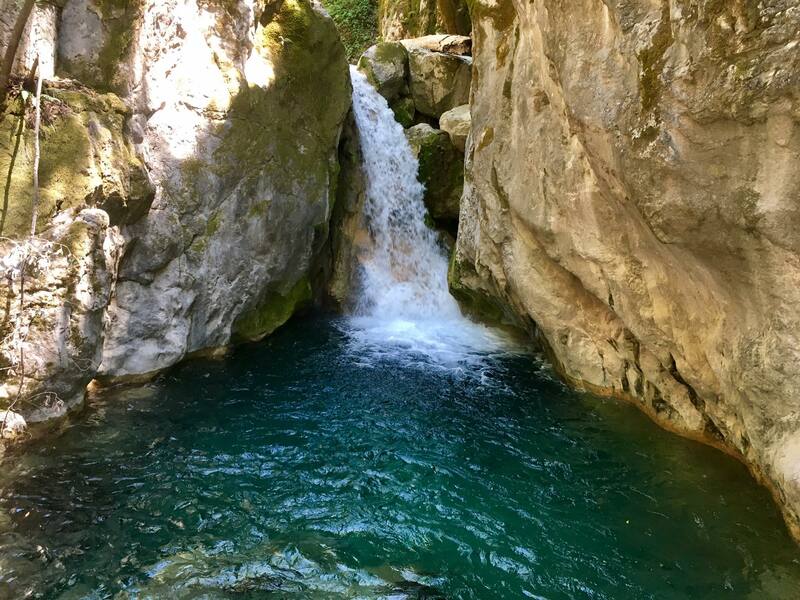 Tassajara Narrows (10 ft): Tassajara Creek grows into a river after heavy rain and its immense power has carved a gorgeous canyon with a cascade into a deep pool with polished white rocks. 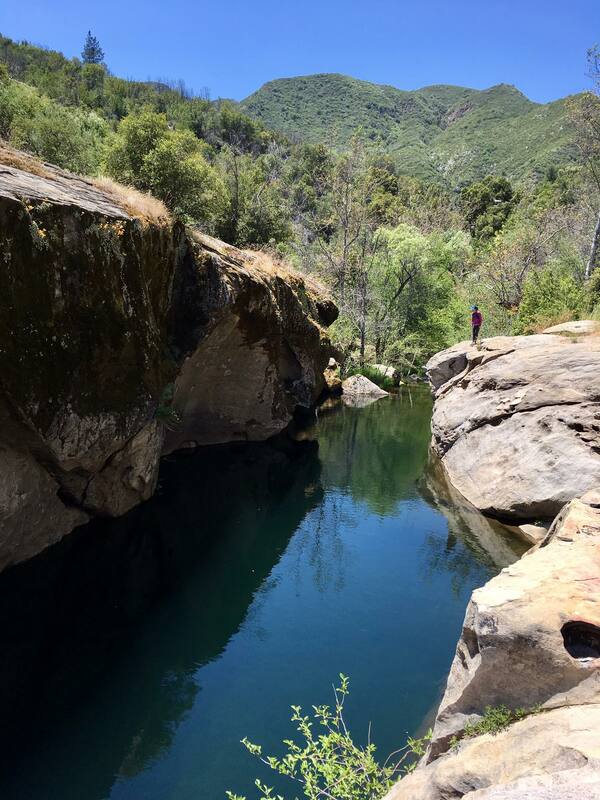 A great swimming hole in the summer months often used by visitors to the Tassajara Mountain Zen Center about a mile away. Kirk Falls * (60+ ft)(FKS): What makes this falls special is the sculpted rock bowl into which the falls plunge complete with a polished face and arm. The main drop of Kirk Falls is around 60 ft but additional falls are downstream including a 30 ft falls requiring a work around. Upstream of the falls are also additional segments, but they are largely inaccessible in an exceptionally rugged slot canyon. Island Falls (80 ft): A wispy falls falling off the flanks of Island Peak into the Big Sur River about 0.5 mile downstream of Barlow Camp. 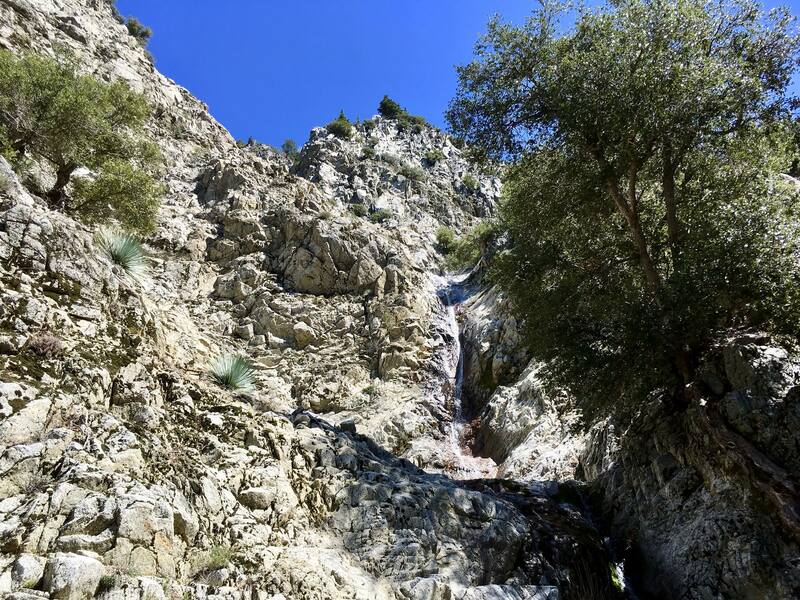 While the falls would be more impressive in higher flow, it may be virtually inaccessible since the falls is in a rugged section of the Big Sur River where it would not be a good spot to be in high flow. Upper Zigzag Falls (6 ft est. ): A small falls flowing into pretty sculpted and cavernous pool. Upper Luna Falls * (100 ft over multiple steps)(FKS): Located in a remote and rugged canyon, the main falls comes in around 45 ft but there are multiple cascades and smaller falls with associated small pools in the vicinity. The various pools, cascades and small falls in a lush setting add up to a pretty package. See video under Luna Falls. Limestone Falls (50+ ft over several steps): Deep in the Middle Fork of Limekiln Creek the watercourse enters a narrows with a series of small falls and pools. Partington Canyon Falls (20 ft over two steps): Just upstream of where the Tanbark Trail switchbacks out of the Partington Creek canyon lies a nice two step falls in a lush setting. 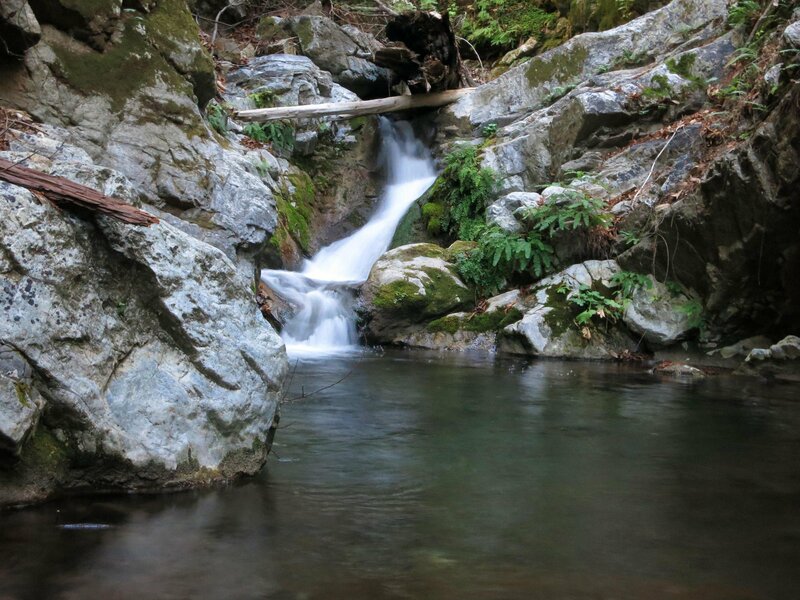 See video footage below in the Tanbark Cascades entry (which are located upstream of Partington Canyon Falls). Camp Falls (45 ft est. ): Near the confluence of Camp Creek and Zigzag Creek is a pretty falls that slides down a rock face. 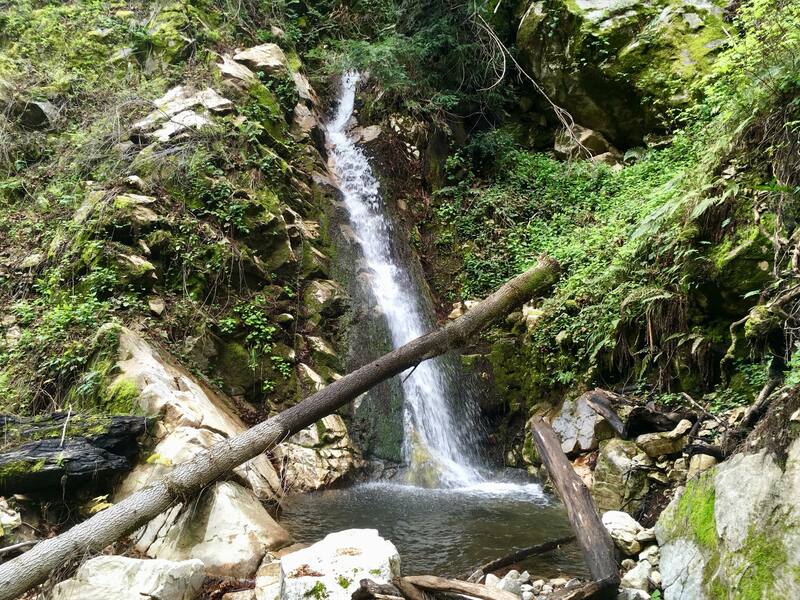 Manuel Peak Falls (90 ft): After heavy rains a couple very ephemeral falls emerge from the slopes of Mount Manuel and tumble off cliffs down to the Big Sur River. Both tall and skinny falls are visible from the Pine Ridge Trail. 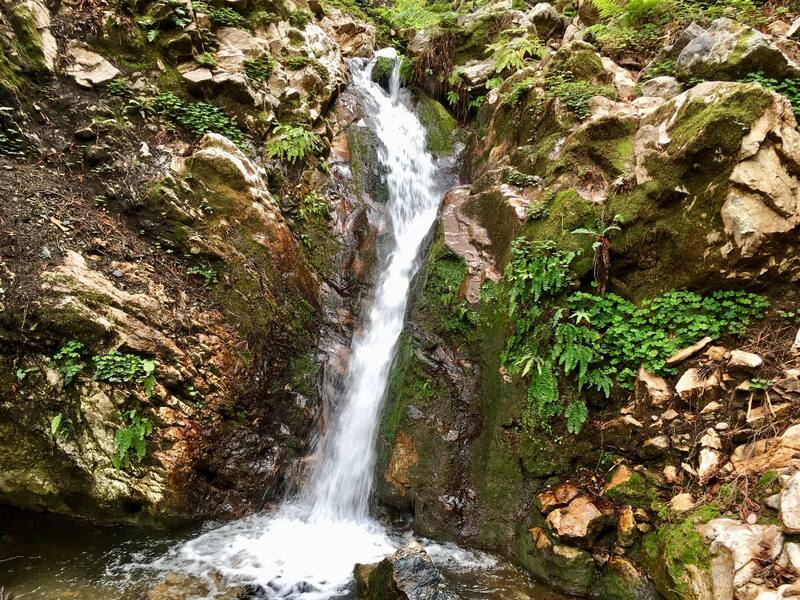 “Manuel Peak” Falls is the first falls measured at 90 ft with a clear birds eye view from the trail across the gorge. “Mount Manuel” Falls is the second falls with substantially more flow and height with several steps totaling 240 ft. However, the brush growth along the trail near “Mount Manuel” falls provides limited viewing options. At present time you can still see the entire falls through breaks in the brush. It should be emphasized that these falls are only in commission with enough flow to be visible from the other side of the canyon for a few days after heavy rain. Mount Manuel Falls (240 ft): See description above. Upper Camp Falls (25 ft est. ): The culmination of a series of small falls upstream of the Marble Peak Trail. Tanbark Cascades * (series of 10-20 ft falls): A series of cascades and small falls in the tributary of Partington Creek as it rounds a rocky corner. The Tanbark Trail switchbacks well above the cascades to avoid the cliffs. The creek walk access is fairly arduous due to copious debris, deadfall and riparian growth in the canyon. Mini Ventana Falls * (40+ ft) (FKS): At the highest reaches of the Drain where surface water is often found. Balcony Falls * (80+ ft)(FKS): A narrow pencil falls separated two talus fields and otherwise surrounded by cliffs, it’s as if the water is falling from an upper balcony to a lower balcony. Upper Higgins Creek Falls (15 ft est. ): Higgins Creek pours over a short but sharp cliff, almost like a dam. The falls is set amid willows and sycamore. Since it resides in the upper reaches of the watershed, it usually doesn’t have much water, but in high flow the water will flow broadly across the short cliff and this is when it’s the most scenic. Surprise Falls (18 ft est. ): A small waterfall in a rugged canyon with many falls, large and small. This one is just tall enough with a significant plunge pool to merit mention. Sandstone Pool *: Spectacular sandstone cliffs and formations surround this pool. 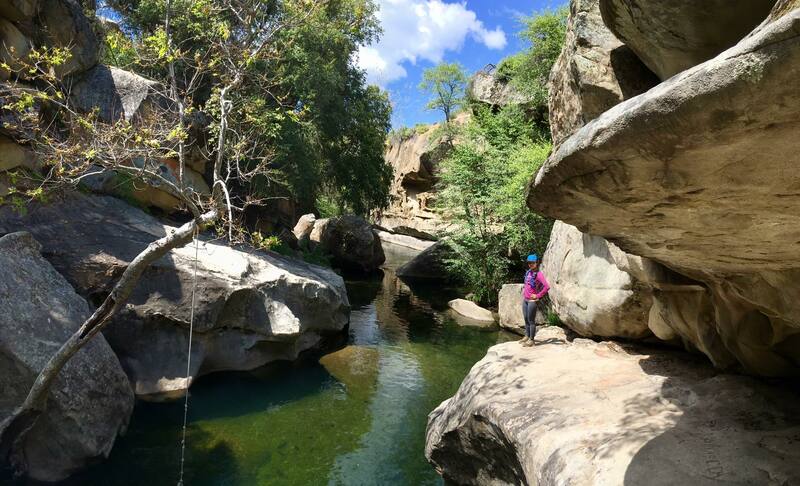 Escondido Pool: On the Arroyo Seco below Escondido Camp, this long and deep pool includes sculptured rock walls that make for excellent diving boards. Soberanes Falls (40 ft total): Soberanes Falls is one of the prettier coastal falls in Big Sur as it flows over a vertical slab of bedrock in a small cove at the mouth of Soberanes Creek in Garrapata State Park. The main drop to the cove is around 25 feet with a few more cascades and small pools above the tallest segment. A nice bridge immediately above the falls was recently installed along with an official path. Redwood Gulch Falls (~20 ft): Located just off highway 1 in the southernmost redwood grove is a pretty cascading falls. Lion Rock Falls (20 ft): Short but pretty. Highbridge Falls (40 ft): Sometimes the best part of a falls is what’s next to it. Despite not having any metrics that would suggest an impressive falls Highbridge has some special qualities. The small stream that feeds this falls is likely spring fed and includes heavy mineral sedimentation. Most of the water flows into the main watercourse but a small amount flows to the side creating a drip that has deposited a thick mineral accumulation on the rock wall next to the falls. On this crusty mineral surface grows a lush array of ferns and moss. As is usually the case with mineral sedimentation, the resulting mineral “apron” is overhanging, in this case resulting in a miniature cave with mineral stalactites. This falls is best viewed in “high” flow (which is still not much volume) and also in the spring when the ferns and moss are at their peak. Prewitt Falls * (60+ ft)(FKS): This falls was found in late fall during drought so flow was very low, but it promises to be impressive after winter rain as it plunges over a 60+ ft wall of moss and ferns. 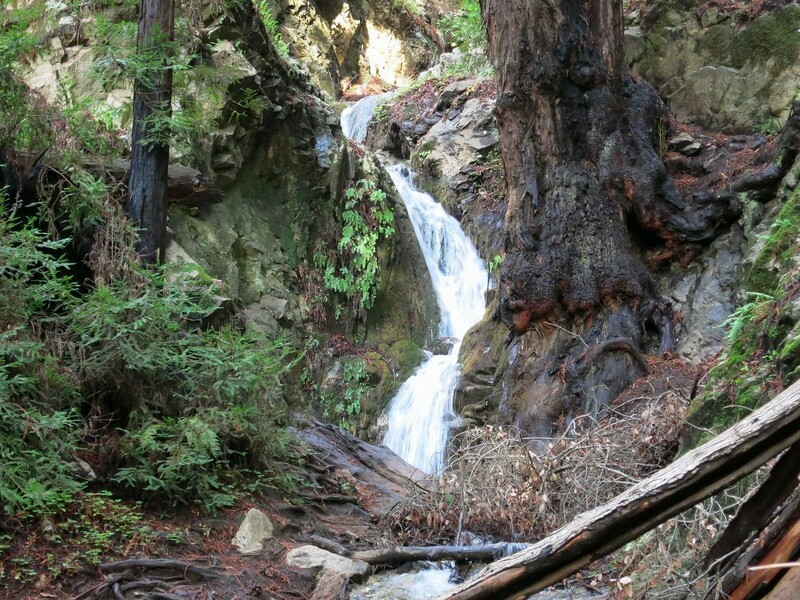 The impressive setting of this falls is highlighted by a steep cirque and redwoods. Boronda Falls * (50 ft)(FKS): This falls is located in a 600 ft hole beside Boronda Ridge. Access is very steep with some rock scrambling near the bottom. This drainage sustained heavy damage in the Basin fire in 2007 and it hasn’t quite recovered yet with many snags still standing and riparian growth chocking the watercourse reducing the attractiveness of the setting. The main drop is at least 50 feet tall and additional segments below are largely concealed with riparian growth and deadfall. While I suspect a spring feeds this falls most of the year, this falls would be particularly impressive after heavy rain. Pfieffer Falls (60 ft): The touristy Pfieffer Falls is among the top four most visited waterfalls in Big Sur (along with McWay, Salmon, Limekiln) but it’s probably the least impressive of the bunch. Unlike many other Big Sur waterfalls, the lush riparian vegation alongside and beneath the falls has been wiped out by heavy human visitation. The falls is also less than vertical – almost a slab waterfall. Finally, the falls is generally low flow since Pfieffer-Redwood Creek is a relatively small drainage. That said, the falls is measured at 60 ft so I’m sure it would be more impressive after rainy periods. In addition, immediately above Pfieffer Falls is a photogenic stair-step cascade; prettier than the main drop in my opinion. Wild Pfieffer Falls * (35 ft)(FKS): In my quest to catalog the known and unknown waterfalls of Big Sur I noticed a rugged canyon upstream of Pfieffer Falls and judged this to be a likely spot for additional waterfalls. I found that a pretty waterfall does indeed exist in this canyon, a secret to virtually all of the tourists who visit Pfieffer Falls below, and untamed by footprints, fences and selfies. Thus, I named the cataract “Wild Pfieffer Falls.” Unlike Pfieffer Falls, Wild Pfieffer has plentiful vegetation at its base and alongside the watercourse. While the main drop of Wild Pfieffer is only ~35 ft tall, it’s a pretty falls in a nice setting with the canyon walls surrounding the falls. It’s certainly worthy of a visit in the future when flow is higher and there are potentially additional falls upstream. Pothole Slide Falls (35 ft): Located next to the Lost Valley Trail as it descends into Lost Valley, Pothole slide falls is a series of two slides down a smooth rock face with a pool in between, the “pothole.” The falls is more horizontal than vertical and the drainage upstream is small so this falls is best viewed after recent rain. McWay Canyon Falls (20 ft est. ): The other falls above McWay Falls is McWay Canyon Falls which is located on a tributary of McWay Canyon Creek with commensurately less volume. However, the falls is in a pretty setting with five finger ferns and the sprawling root system of a large redwood right next to it. 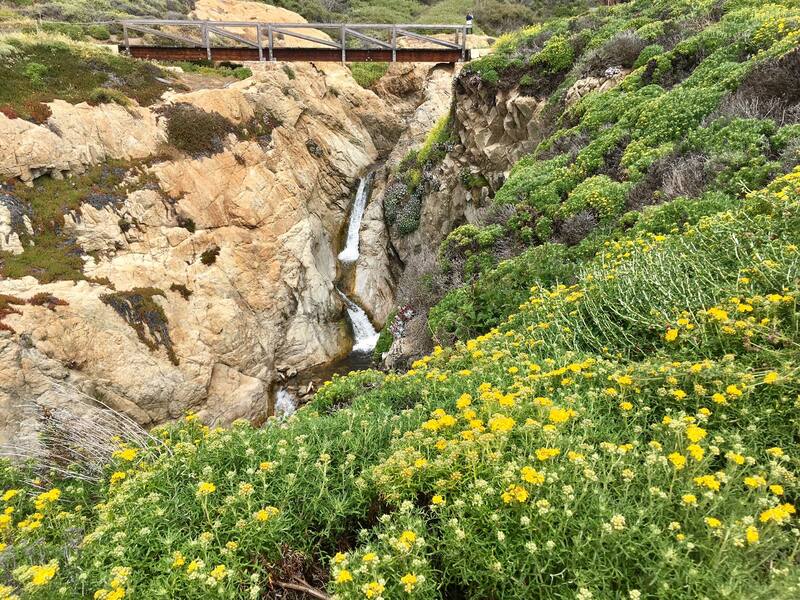 Sierra Falls (100+ ft): A tall two-step falls off the ocean bluffs that falls virtually onto the sand. The lower segment is far and away the taller of the two. The falls is fairly ephemeral and only produces substantial flows after heavy rain. 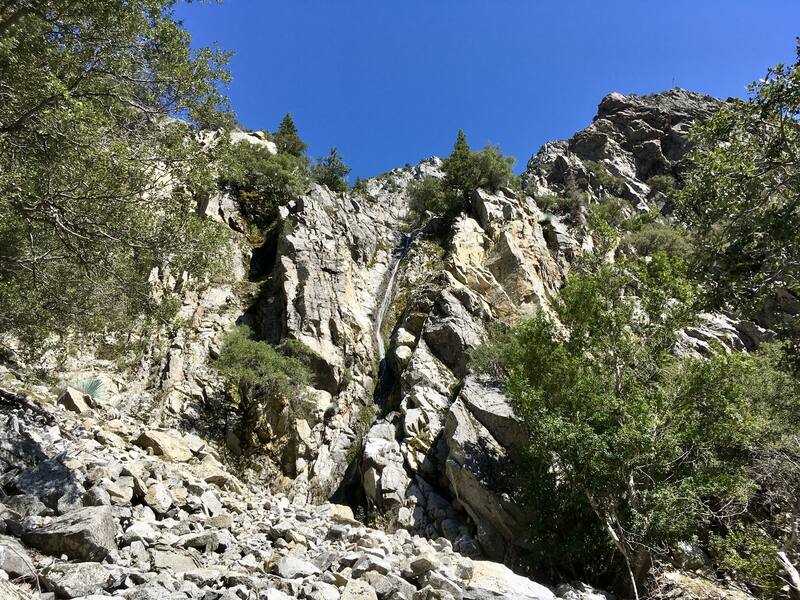 Ventura Falls (100+ ft): Around the corner from Sierra Falls is an even taller, but more ephemeral falls. I look forward to returning when the falls is in peak flow after heavy rains. Fuller’s Falls (60 ft+): Hear the sound of waves crashing ashore and water falling from above simultaneously. A unnamed stream from a small drainage flows over all ocean bluffs and nearly onto the beach. The falls is surrounded by cliffs adorned with pampas grass. Riparian Falls (60+ ft): A two-tiered falls near the outlet of the stream into the ocean has thick riparian vegetation characteristic of near-coast falls. Grimes Gorge (50 ft): A series of cascades totaling 50 ft in a picturesque narrow gorge at the mouth of Grimes Canyon and the incredibly rugged Grimes Point. Graves Falls (20 ft): A 20 ft falls at the mouth of Graves Creek with additional small falls upstream. Granite Creek Falls (15 ft): At the outlet of Granite Creek beneath Granite Creek Bridge. The falls is small but it drops into a rugged photogenic cove. Mocho Creek Falls (18 ft): Located just upstream of Mocho Creek’s confluence with the South Fork Little Sur River, Mocho Creek Falls is a pretty falls in a cliffy nook with a garden of hanging ferns beside it. Launtz Falls * (100+ ft over multiple steps): Launtz Falls is at the base of a small tributary descending from Launtz Ridge that flows into the Little Sur River. The bottom of the falls is visible from the usepath to Fox Usecamp and you can get a sense there is much more above, but it is not clearly visible unless you cross the Little Sur River and ascend the ultra steep slopes on the other side. Upon climbing the slopes a tall falls presents itself flowing over a lush cliff face. See video footage of Firehose Falls in the Little Sur Circular Pools video above.